Pierate - Pie Reviews: Does Bowkett's get my supreme pie vote? When you are away for the weekend with a group of friends, there are surely few better ways to bond together than over a pie or eight. 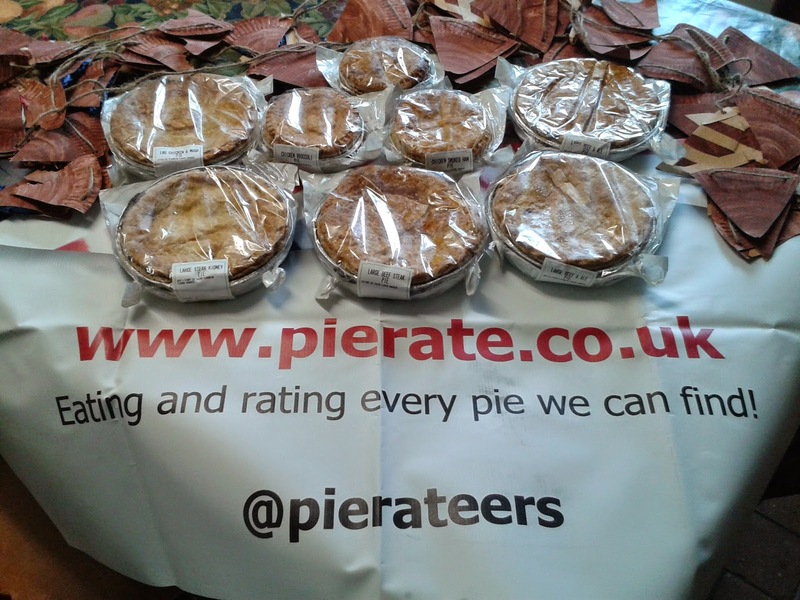 So with a group of 20 of us from my church small group going away to the Shropshire countryside for a weekend together and Pierateer RAS asked to head up cooking the Sunday lunchtime dinner, you won’t be sur-pies-ed to hear that there were pies on the menu! Well… eight to be precise. Knowing we were going away and having heard of top pies being sold at a local butchers in Birmingham, the Senei kindly picked up a large supply of pies from Bowkett’s of Oldbury for us all to enjoy. They are well known for being the “Supreme Sausage Champions of Great Britain” (their words) but how would their pies rate? 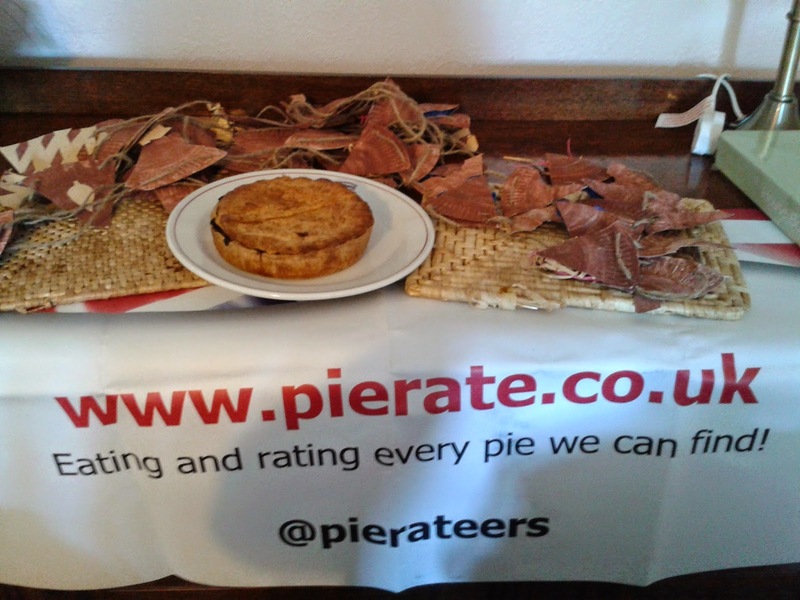 We had a selection of the pies between us, but the pie I rated was the Beef Steak Pie. At £3.58 for a family pie for three people, this was a very enjoyable pie that tasted very nice and was great value. The pie was a great golden colour, with a flaky pastry lid and a nice, firm side pastry. A few parts of the base pastry were a little thick in places, which highlighted the handmade nature of the pie but is a slight room for improvement. However I was very happy to see that I could pick up a slice of pie in my fingers – a sign of a proper pie, if you can pick it up and bite without it falling apart! The capacity of the pie was spot on, absolutely packed with meat and gravy. However the content, while tasting nice and tender, was very fine and soft. It meant you couldn’t really get your teeth into the meat, with no issues over chewiness but not much in the way of bite. 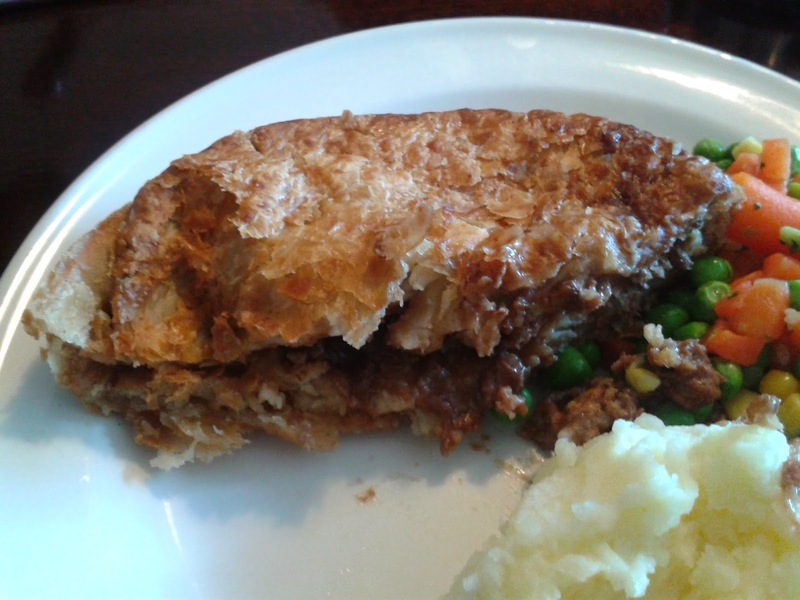 Don’t get me wrong – I enjoyed eating this pie and look forward to rating some other flavours, but the lack of meaty chunks and overly fine beef steak did mean it lost a few points for consistency and content. You may also notice from the photo of the whole pie that there was a bit of boil out, which slightly diminished the condition in our quest to look for pie-fection. However I did thoroughly enjoy the pie and had a great time away with friends. I will certainly be looking to get my hands on more of the pies at Bowkett’s of Oldbury in the future!